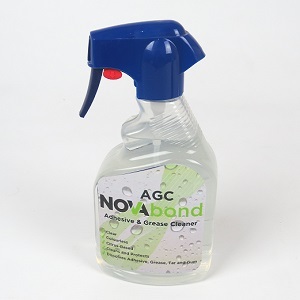 NovaBond AGC – is a professional strength, safe solvent cleaner in a tough trigger spray for removing oils, greases, adhesives, silicone, lubricants, wax, rubber marks and tar from; sign-making components, metal, glass, plastics and painted wood. It will also clean up workshop tools and cutting machinery. Apply the NovaBond AGC and allow 5 – 10 minutes for the cleaner to penetrate the contaminated surface. Wipe the contaminant off and cleanse the surface with mild detergent/soapy water. Click HERE to link through to our full cleaners & primers product range.